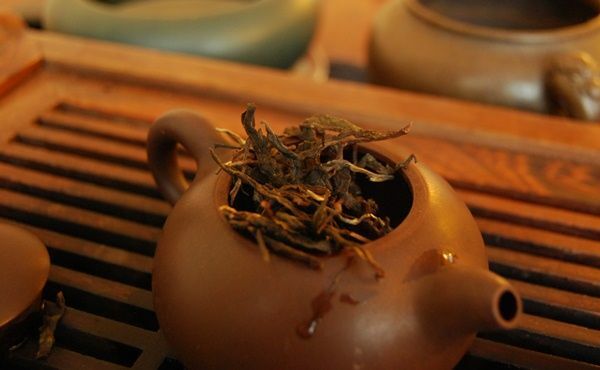 The tea world is a great little place, as well you know. There are all manner of characters within it, and I am grateful for the friends I've made in places where I would otherwise have no hope to do so. Take, for example, the case of Jerry M., who is (I think) a professional photographer, and who set up the China Chadao enterprise, which started as an eBay shop and has just recently metamorphosed into a very attractive web-site of its own. China Chadao has been selling decent cakes at eBay-friendly prices, the majority of which that I have tried have been Douji. Perhaps due to the pressures of time, my notes tell me that I haven't tried any Douji cakes after 2010 - a recent parcel from Jerry seems like a good opportunity to see what's new with one of my trusted brands. Douji cakes started out really (really) very good; I seem to remember being introduced to their earlier work by the owner of Fangmingyuan, in Maliandao, at the recommendation of the Duke of N, back when we were calling them "Yisheng". Since then, Douji-branded cakes have become bipolar: there is a blended range of lower-priced cakes (Dadou, Shangdou, Xiangdou, etc.) and a "single mountain" range of higher-priced cakes. The blends have always been stable and fun - and instantly recognisable. The single mountain cakes are usually very decent examples of their region, but perhaps tend to be a bit on the expensive side, from all outlets (Taobao, eBay, etc.). Heading straight for the Banzhang, I was impressed by the very pleasant leaves, pictured above. They are mostly whole, and well-kept, with the inclusion of some tips (although not too many). 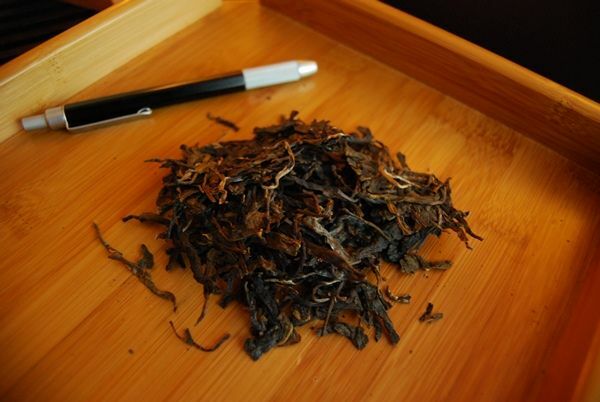 The dry leaves exude a delicious scent of fruity sweetness that bodes well for a good series of brews. Like most Douji sessions, I enjoyed this cake: it was stable, solid, decently Banzhang, and had tip-of-the-tongue-numbing activity that suggested the inclusion of at least some good leaves. 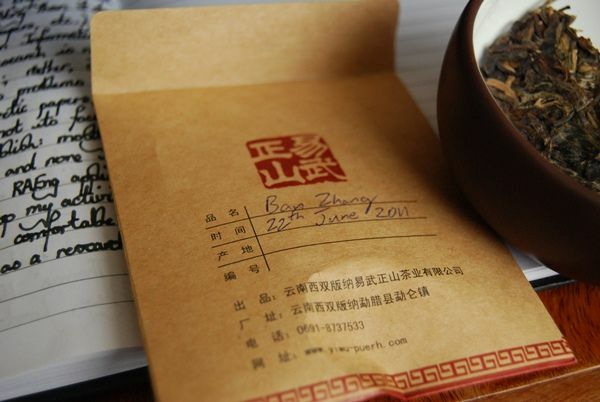 It is perhaps unfair to compare it to the very best Banzhang cakes that I have come across, against which it cannot compare; then again, this cake is priced quite seriously: it is $170 / 357g, and therefore invites comparison. Perhaps most appealing was that dark, tobacco richness that many Douji cakes seem to have acquired. It is light in the body, but does deliver a charming combination of clean, heavy sweetness alongside that very welcome tobacco base. If this were half the price, I would be really quite tempted. 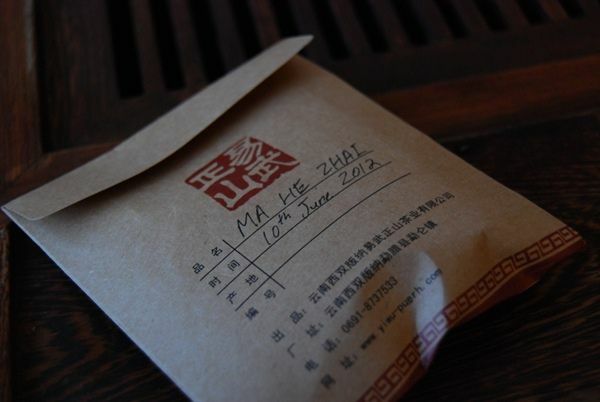 The Banzhang was, however, the "warm up act", setting the stage for the Maheizhai (spelled "Mahezhai" at the web-site). This is a "special edition" 200g xiaobing, which sells for a significant $80. Actually, this "special edition" is a little cheaper than the Banzhang from earlier, per unit weight... 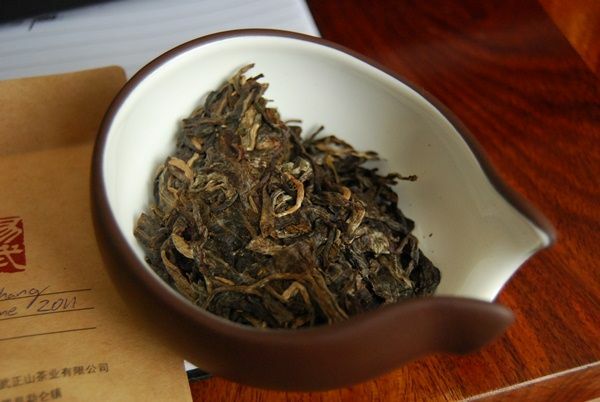 It would cost $143 for 357g, compared with the $170 of the Banzhang. I suspect that the latter has undergone simple "LBZ" inflation; cakes claiming to be from this region, including those from the Douji label, are often much more expensive than cakes from other regions, as well we know. The leaves are clearly much better quality than the Banzhang cake, being entirely whole, unbroken throughout, and rather long. Pictured below, it is difficult to get them into the pot, whereby a little warm water eases their progress by softening them up. 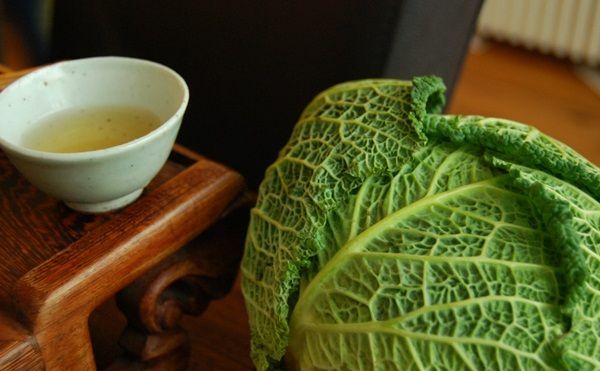 This is a cake that is a good comparitor for the Banzhang: the Maheizhai (ma-hay-djeye) leaves generate a much increased cooling sensation that floats on the breath, and completely decongests my nose. 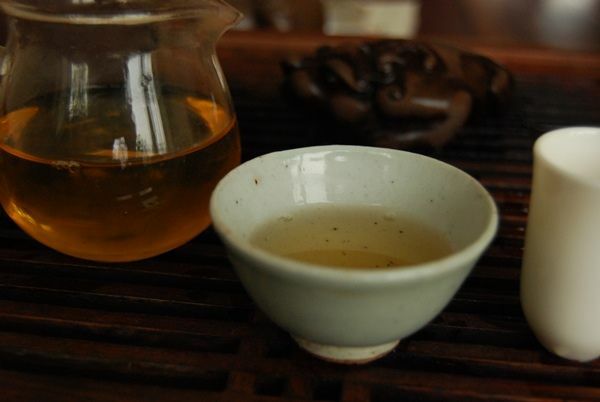 It is sweet, clean, and very "Yiwu". It is also a cake that takes a number of infusions to get into its swing, which can be a good sign that, perhaps, the cake has a good amount of content that it is slow in relinquishing. 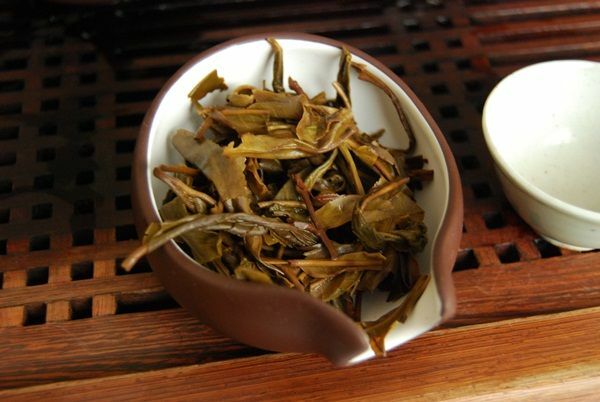 Certainly, it endured a good number of infusions and remained clean and sweet throughout. By this stage, it will not be surprising to learn that the Maheizhai cake has a solid base of tobacco, as with most Douji products. In Yiwu, tobacoo can be charming - and maybe almost necessary, to my (possibly rather odd) tastes. We have, then, two very clean, sweet, and tobacco-laden cakes that I found to be enjoyable both. As ever, Douji demonstrates that they make reliable, thoroughly safe cakes. As ever, I begin to wonder if they are not beginning to price themselves a bit on the high side. As far as the tea goes, it is light but very enjoyable. Thanks again to Jerry for the opportunity to try some of Douji's latest, and very enjoyable, creations. I don't know which banzhang exactly you had, but the one I had from 2012 was positively awful, and at an incredibly expensive price as well. It was bitter, bitter, bitter, with no sweetness to save itself.